Motorist Assurance Program – M.A.P. At Big O Tires, we do brakes, and lots of other types of automotive repair too. Every part of a vehicle suffers wear and tear, but how you drive your vehicle can often help reduce the amount of wear and tear on various component parts, decreasing the frequency at which those parts need to be replaced. 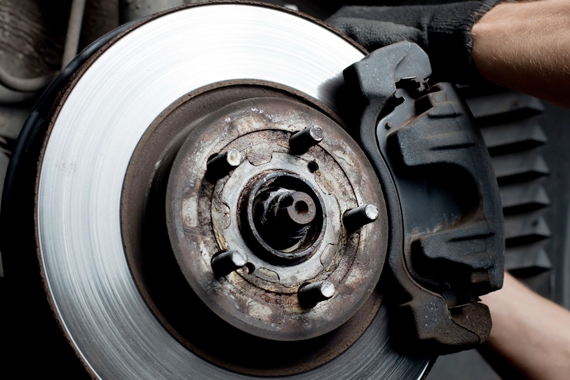 Brakes are one of the easiest parts of a vehicle to reduce wear and tear on, just through some simple adjustments to your driving technique. Speed kills! And that’s certainly true when it comes to your brakes. A car uses kinetic energy when it’s driving. Kinetic energy is a factor of half your vehicle’s weight times the square of its speed! Since brakes turn energy into heat, the less energy required to stop your vehicle, the less heat your brakes have to endure. Sounds very scientific, but put simply, the faster you’re going when you initiate a stop, the more heat (and wear) you’re applying to your brakes. So, slow down. Try coasting. If you know you’re coming to a stop further down the road, instead of traveling full speed until you reach the stop, start coasting and allow the drag on the vehicle to slow its momentum before you get there. Again, this will put less stress on your brakes when it finally comes time to reach a full stop. Monkey see, monkey do! That’s what often happens, especially on busy highways or in congested traffic. Someone sees a brake light ahead of them and the brain instinctively says to follow suit. But just because the driver in the distance tapped his or her brakes, doesn’t mean you need to, necessarily. Try coasting until you know you need to brake. Obviously, consider road conditions and the distance you are from the vehicle in front of you, to give yourself enough time to stop safely. But just because that red light in front blinks, doesn’t always mean you need to hit the brakes. Shed a few pounds! Hold on, don’t be offended, we’re not talking about you… we’re talking about your cargo. It’s amazing how much ‘stuff’ people hoard in their vehicles. The more weight you reduce from traveling around with unnecessary items in the trunk, for example, reduce your vehicle’s momentum when it comes time to braking. Remember the weight vs speed kinetic energy formula? Less weight means less wear and tear on those brakes. Always remember to flush!.. the brake fluid that is. Brake fluid attracts moisture. Moisture promotes corrosion. Bleeding and flushing your brake fluid periodically (we can do it for you or you can do it yourself) will help extend the life of your brake system’s internal components. Today’s brake pads are far more advanced than those of our Father’s day and age. But they do wear out. If you start to suspect your brakes may need replacing, come see us at Big O Tires. We’ll examine your brakes and let you know exactly how much life is left on them! © Copyright 2019 Big O Tires BC (1978) Ltd.